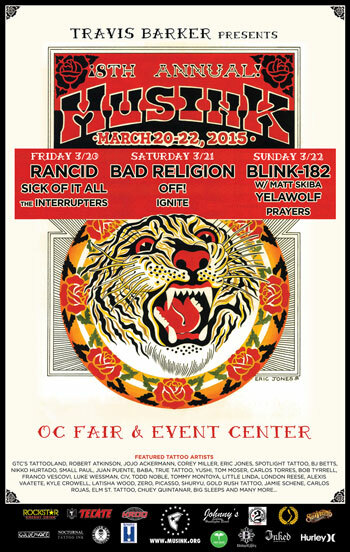 MUSINK Returns To OC Fair & Event Center On March 20-22 with Performances From Blink 182 w/Matt Skiba, Bad Religion, Rancid, Yelawolf, Sick of it All, OFF!, Ignite and More! January 26, 2015 – Los Angeles, CA – Southern California’s highly anticipated music and tattoo festival MUSINK will return to the OC Fair & Events Center in Costa Mesa, CA on March 20th-22nd with an impressive lineup of musical acts including Blink 182 w/Matt Skiba, Bad Religion, Rancid, Yelawolf, OFF!, SIck of It All, Ignite and more! Presented by Blink 182’s Travis Barker, MUSINK will also feature hundreds of world renowned tattoo artists including Robert Atkinson, Jojo Ackermann, Corey Miller, Eric Jones and BJ Betts among others. Tickets for MUSINK will go on sale at 10:00AM PT on Friday, January 30th at http://www.ticketfly.com/search/?q=musink. Over the last seven years, MUSINK has become the pinnacle festival in Southern California and throughout the country for celebrating music and tattoo culture. Some of punk rock’s most influential bands have graced the stage like The Descendents, Pennywise, Tiger Army, Alkaline Trio, Against Me!, New Found Glory, Suicidal Tendencies, Thrice, The Used, The Cult, NOFX, Danzig, Gorilla Biscuits, H20, Transplants and Rev. Horton Heat, to name a few. This year MUSINK ups the ante with three nights headlined by punk legends Blink 182 with Matt Skiba of Alkaline Trio, Rancid and Bad Religion! In addition to the music, MUSINK will host hundreds of tattoo artists, local punk rock vendors and a bevy of food and drink. Fans can also purchase special VIP tickets to the NEW Johnny’s Saloon & 2nd Floor VIP area in the Baja Bar & Grill. Tickets include in & out privileges, side stage viewing area, access to a very nice VIP area next to the band area with complimentary drinks (21+ only) and discounts on food by the 2nd floor. Single day general admission and VIP passes are available, as well as 3-Day general admission and VIP passes. Tickets will go on sale to the public on Friday, January 30th at http://www.ticketfly.com/search/?q=musink. Stay tuned to http://www.musink.org/ for additional news and updates.